"If we do not reach a deal over the next few months, let us be in no doubt, since once the damage from unchecked emissions growth is done, no retrospective global agreement, in some future period can undo that choice, by then it will be irretrievably too late. So we should never allow ourselves to lose sight of the catastrophe we face if present warming trends continue. Only last week we saw new evidence of the rapid loss of Arctic sea ice. And in just 25 years the glaciers in the Himalayas, which provide water for 3/4 of a billion people could disappear entirely. IPCC estimates tell us now, that by 2080, an extra 1.8 billion people, equal to a quarter of the worlds current population, could be living and dying without enough water. If the international community does nothing to assist the rain-forest nations in protecting the worlds rain forests, the damage not just to climate, but to bio-diversity to watersheds and to the livelihoods of millions of people will as you know here be incalculable. And the recent report of the global humanitarian forum led by Kofi Annan, suggests that 325 million people are already seriously affected by drought, disease, floods, loss of livestock, lower agricultural yields, and decline of fish stocks. A further 500 million people are at extreme risk. And every year the effects of climate change are already killing 300 thousand people, the numbers killed by the Indian tsunami. And the talk advised too half a million each year by 2030. 98% of those dying and otherwise seriously affected live in the poorest countries, and yet their countries account for only 8% of global emissions. This is the great injustice of climate change, those being hit first and hardest by climate change are those who have done least to cause it." 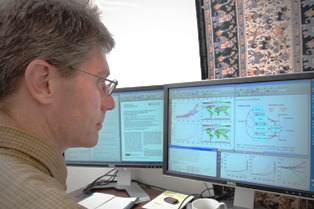 In the ongoing effort to refine climate models a multi-interdisciplinary team of scientists from organizations including The Department of Energy's Oak Ridge National Laboratory and the National Center for Atmospheric Research and NOAA/ESRL and several research universities are published in the current issue of Biogeosciences. The report exemplifies the need for interdisciplinary work to increase understanding in complex systems. "In order to do these experiments in the climate system model, expertise is needed in the nitrogen cycle, but there is also a need for climate modeling expertise, the ocean has to be involved properly, the atmospheric chemistry . . . and then there are a lot of observations that have been used to parameterize the model," said Peter Thornton, who works in ORNL's Environmental Sciences Division. Climate scientists from across the country have incorporated the nitrogen cycle into global simulations for climate change. Scientists discovered that when plant nutrient requirements are included in the climate model, showing how plants will perform in the future, the rate of climate change could be higher than previously anticipated over the next century. Peter Thornton discusses that the land ecosystem response to increasing CO2 concentration is smaller by a factor of 2-3 times in their study compared to previous studies that ignored the nitrogen cycle. Older studies, and the present study, estimate carbon uptake response to increased CO2 in the atmosphere. In both cases, there is an increase in plant growth under higher CO2, but that increase is smaller when the nitrogen limitation is considered. There could be limitations for food production. "This study points to the need to consider nutrient limitations, so that we can accurately estimate the nutrient fertilization requirements for optimal crop production under future climates." According to Peter Thornton, integrating new assessment models with expected emission scenarios based on current understanding of atmospheric and ocean chemistry is expected to yield refined results in predictability for future expectations by narrowing the degree of uncertainty. By integrating the nitrogen cycle to the GCM's (Global Circulation Models) scientists can see a clearer picture regarding projected CO2 concentration in the future. This ultimately may translate to better understanding of future agricultural productivity tied to the nitrogen cycle. Refining expectations gives us a better understanding of what to expect based on the way atmospheric, land, and ocean systems interact, as global warming progresses.